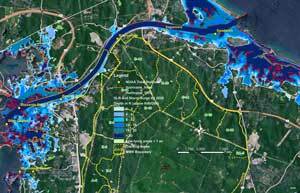 To understand and mitigate the challenges caused by potential extreme events related to climate change, the Massachusetts Army National Guard (MA ARNG) initiated one of the defense industry's first and most comprehensive climate change vulnerability assessments at Camp Edwards in Massachusetts. The effort identified at-risk infrastructure using a state-of-the-art, GIS-based, sea level rise and storm surge inundation model. 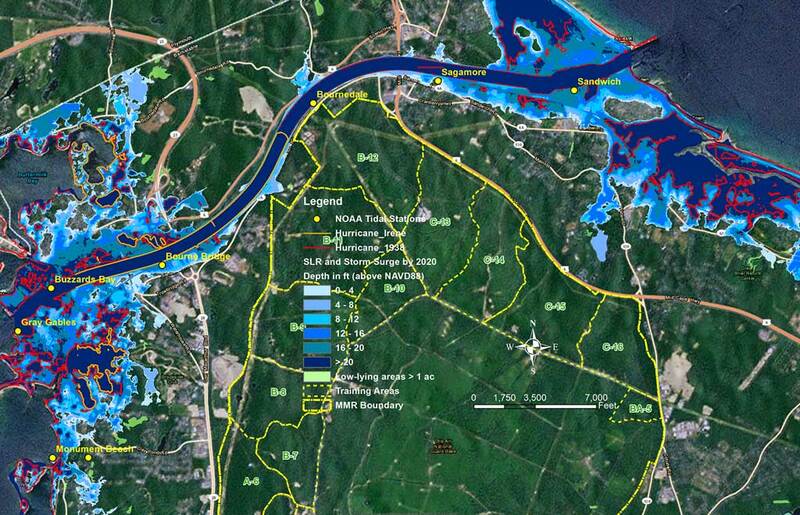 The GIS model, developed by Kleinfelder based on the methodology used by the National Oceanic and Atmospheric Administration (NOAA) Coastal Services Center to map sea level rise inundation, was approved by MA ARNG. It was used to develop a quantitative and qualitative climate risk matrix from which the Guard is able to prioritize planning areas and prepare adaptation and resiliency plans. 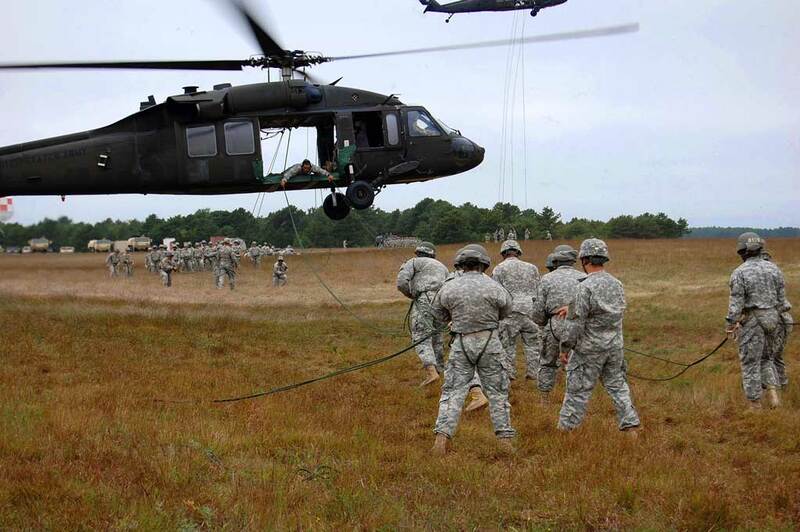 The 22,000-acre Camp Edwards National Guard Base, commonly known as the Massachusetts Military Reservation (MMR), is located on Upper Cape Cod in Barnstable County, a low-lying, coastal peninsula with a fragile connection to the mainland. Sea level rise and storm surge are a primary concern to this area. MA ARNG contracted Kleinfelder, an architecture, engineering, and science consulting firm headquartered in Riverside, California, to conduct a climate change coastal flooding vulnerability assessment and prioritize adaptation solutions to these impacts on MMR infrastructure, training, and operations. The GIS model also incorporates the predicted sea level rise values for 2020 and 2060. The predicted tidal surface elevation for these future periods is a combination of present tidal elevation and projected sea level rise values as a result of climate change impacts. For the Base assessment, the team used predicted storm surge depths based on a worst-case Category 3 hurricane as predicted by the US National Weather Service's Sea, Lake, and Overland Surges from Hurricanes (SLOSH) model to determine the projected water surface elevation at MMR. Days with extreme temperature (i.e., greater than 90° F) are projected to increase to approximately 20 and 40 days, respectively, by 2020 and 2060. For the coastal inundation analysis, the team used Esri's ArcGIS for Desktop with the ArcGIS Spatial Analyst and the sea level rise and storm surge GIS datasets to evaluate the extent and depth of inundation of areas in and around the MMR for the two planning horizons. The projected inundation areas were evaluated for hydrological connectivity to the ocean. Hydrologically disconnected low-lying areas greater than one acre were identified as potential flood areas in case of a breach of higher elevations. The inundation maps were presented in two categories—potential inundation areas from sea level rise, and potential inundation areas from storm surge and sea level rise. The maps further provided the basis for development of a quantitative and qualitative risk-based matrix. The GIS model also incorporated the extent of flooding from two historic hurricanes, the Great New England Hurricane of 1938 and Hurricane Irene in 2011. Both of these events affected the Base and surrounding areas. The analysis projected that the flooding extent from future sea level rise and storm surge will be greater than from these past hurricanes. 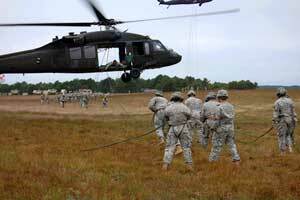 The Guard's climate change assessment focused on the estimated risk to infrastructure and facility operations, environmental concerns, training and test ranges, missions, and military training activities, as well as community and regional dependencies. In this case, risk is equal to the consequence of climate change impact multiplied the probability of occurrence of that impact. Consequence is the impact to the Guard's ability to execute its military objectives. The higher the consequence, the more negative the impact. Probability is the likelihood that a projected climate change impact will occur. Some climate change indicators—such as sea level rise and higher temperatures—are very likely in the Camp Edwards area, whereas more frequent droughts have a lower probability of occurrence. Linking highest likelihood of occurrence of near-term and long-term quantitative impacts (i.e., sea level rise of 4–6 inches by 2020 and 12–27 inches by 2060) with the potential consequences and implications to the physical infrastructure, training, and operations provides the Guard with a comprehensive, detailed qualitative risk matrix that can be used to prepare a climate change preparedness plan. For instance, the risk matrix indicates a low risk of significant flooding on the Base. However, the surrounding low-lying areas are at high risk from sea level rise and storm surge impacts. Likely, coastal flooding will have some impact on the area's transportation and energy infrastructure. Damage to roads could make them inaccessible. Since one of the Guard's missions is to protect the civilian population in times of emergency, damaged infrastructure could hinder the Guard's ability to rescue civilians trapped in inundated areas, especially in case of hurricanes, storm surges, and ice storms. Permanent and temporary inundation of low-lying areas surrounding the Base may cause encroachment from surrounding civilian areas, resulting in potential loss of training areas and competition for existing resources, such as water and electricity. Once impacts and associated risks were identified and quantified in the risk matrix, the team developed a comprehensive adaptation plan. The Guard's adaptation plan incorporates possible short- and long-term solutions to mitigate impacts from extreme events and will help prioritize climate change adaptation strategies. Because of its close relationship with the surrounding community, the Guard's infrastructure adaptation plan will likely involve a number of outside stakeholders, such as municipalities, infrastructure owners, and public health officials. A key goal for the Guard moving forward is to outline its expected level of responsibility for each stakeholder and ensure that adequate support is in place from other supporting entities and agencies. Indrani Ghosh, PhD, is a project professional at Kleinfelder. Her areas of expertise are modeling climate change impacts, conducting climate change vulnerability and risk assessments, GIS data management and modeling, and spatial scaling analysis. She also has significant experience in programming using GIS. She can be contacted at 617-498-4654 or IGhosh@kleinfelder.com. Lisa Dickson, Professional Geologist (PG), is vice president of sustainability at Kleinfelder and is based in the Cambridge, Massachusetts office. She chairs the company's corporate sustainability initiative and is the firm's technical discipline lead for sustainable practices and solutions. She can be contacted at 617-498-4652 or LDickson@kleinfelder.com.